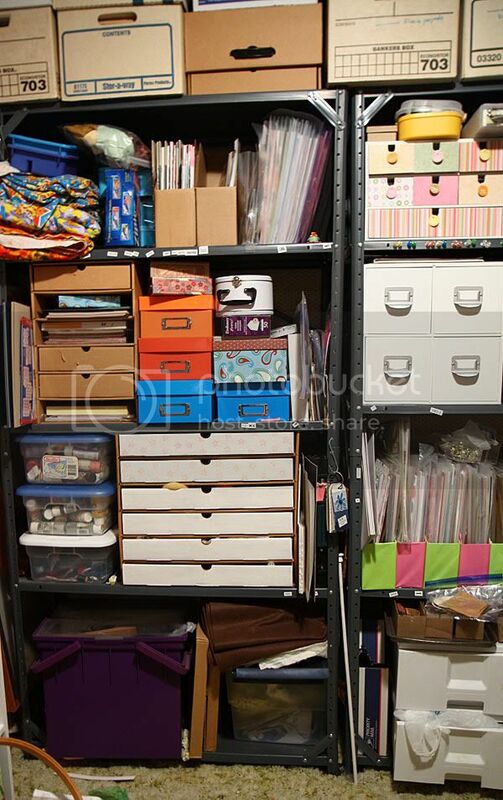 I'm very lucky to have my own craft room. It's a decent sized room, too, with a big window and everything. However I've always kind of had this mix of cheap ugly shelves and desks and stuff. Over the past couple of years I have been slowly changing some of my stuff over to better stuff. My hubby built me a nice work table which I love (click here to see some of it). I switched my ugly green yard sale sewing machine desk to a nicer one that we made together. Now I got rid of the ugly gray metal utility shelves I was using (hey-they were cheap-only about $10 each) and replaced it with jetmax cubes from Michaels. Here are the before and after pics. Warning-these before pics are downright scary. 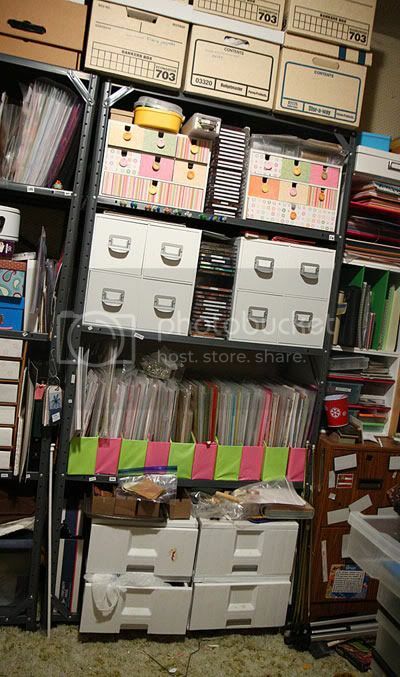 There was no easy to way to store things on these shelves and I was using my old highsmith cardboard storage which was falling apart. 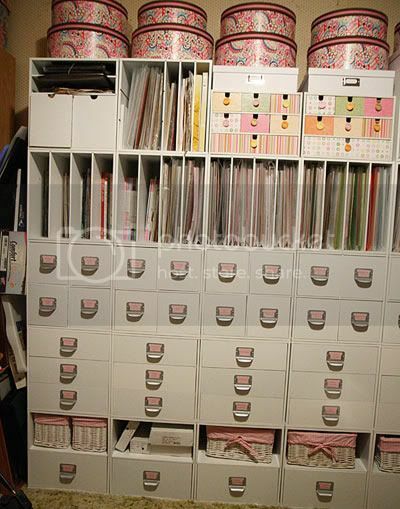 The round boxes on top are from Hobby Lobby-I covered them with wrapping paper and put some of my fabric in them. The white boxes are large storage boxes from Walmart. 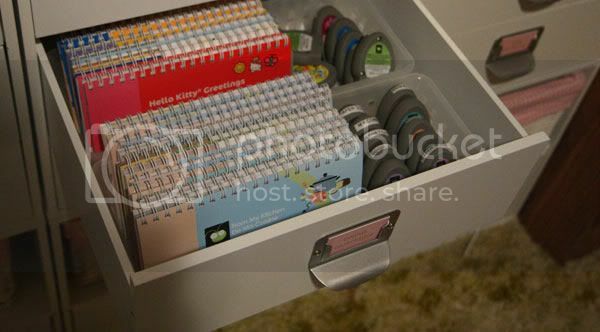 The colorful drawers are Fira chests from Ikea (I don't have an Ikea-a friend got these and sent them to me). The pink and white baskets are from Michaels. 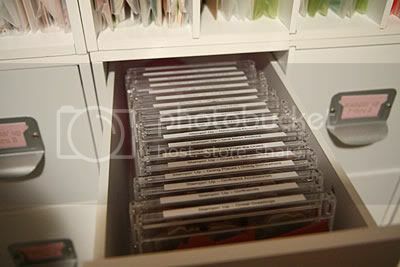 The smaller cubes (far right of the 2nd picture) on top of the file cabinet (which holds most of my bazzill cardstock. Well some of it) are from Big Lots-only $10 each. 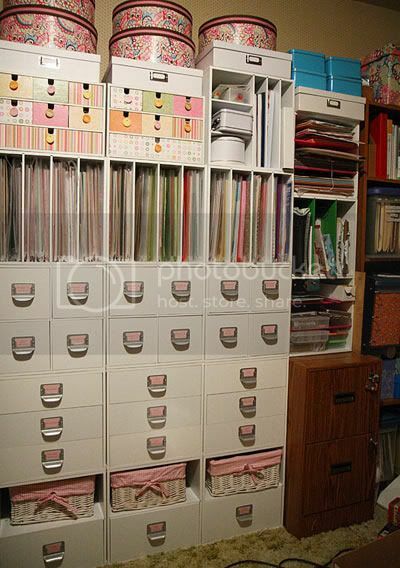 The vertical storage cubes hold my 12 x 12 patterned paper, which is organized by company and put in craft keepers, and also they hold my quilting books and magazines (I keep my scrap/stamp books and magazines in a different shelf unit which I will post later). That junk on the left side of the cubes is just that-junk. I'm going to make a little narrow shelf for that spot which will hold more books and/or magazines. It's still a mess-it always will be because I have way too much stuff. But it's definitely better and I can find things more easily. I'll post more pics as I get it all cleaned up and presentable. I am sooo jealous! What a great organizational system! 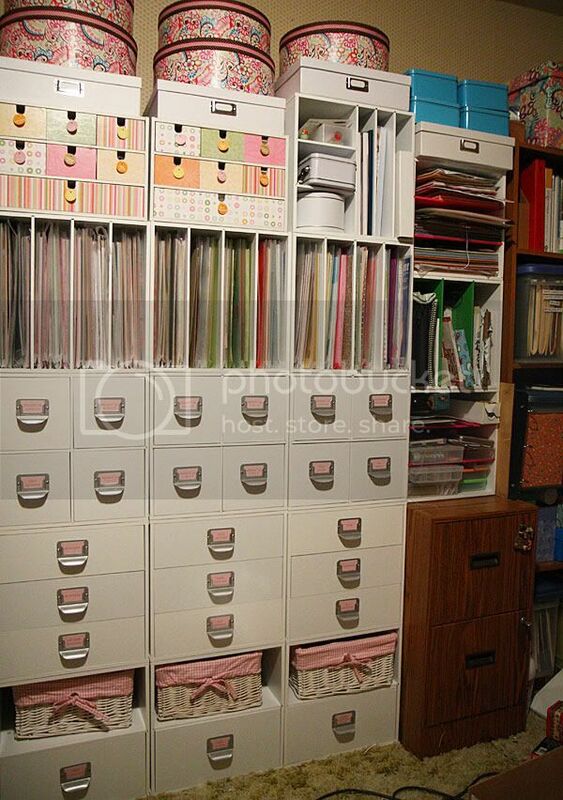 Love the paper storage! That looks so good!! I LOVE IT!!! Your room looks fabulous. I love the new look! Wow, this looks great. The colors are so pretty and it looks so organized. ummmm WOW!!! That looks great! Wow, what a difference! 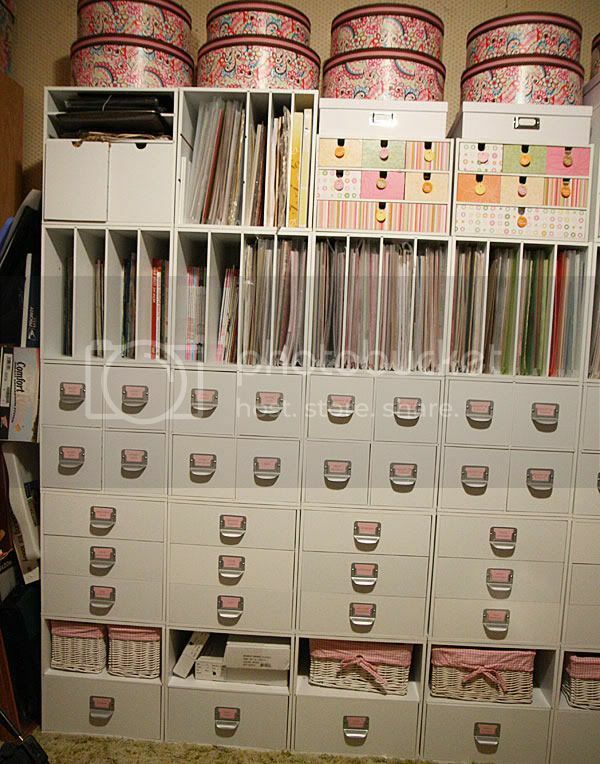 The new white storage is so pretty! I am UBER jealous! 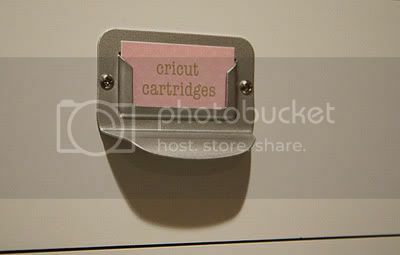 You should see my tiny corner, well I blogged it ages ago, but have added punch rails. This looks so neat and clean, like it would be so relaxing to stamp there! It takes me 15 minutes to clear a 12x12 spot to work, then the supply search begins...LOL! Wow, I am so jealous too! What a great job organizing you did!